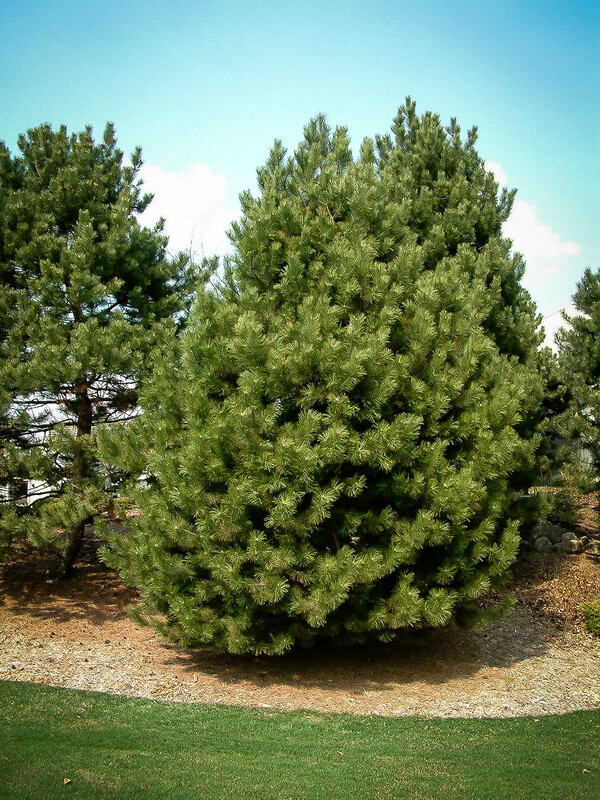 Austrian Pine is a great choice for a trouble-free evergreen for a specimen or a screen. This fast growing tree will soon create a dramatic effect in your garden, with its mottled bark and rounded crown of dense, dark-green needles. Resistant to cold and urban conditions, this tree thrives in almost any soil. It is as rugged as it looks, easily grown and resistant to intense cold down to minus 35 degrees. Austrian Pine is widely chosen by professionals for its reliability and resistance to problems. 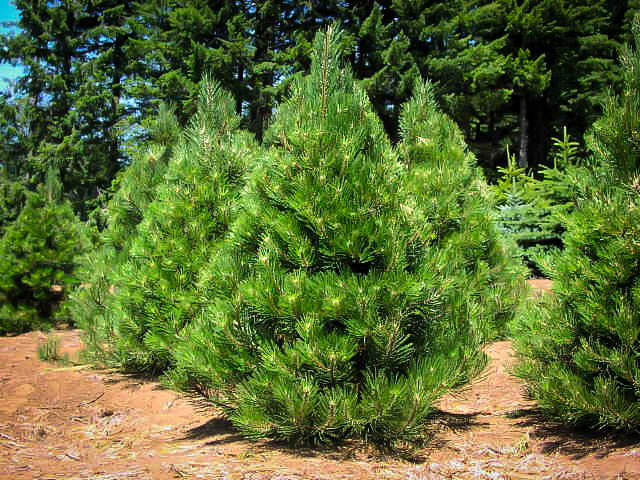 Its pyramidal crown is unusually dense for a pine tree, making it an ideal screening plant. 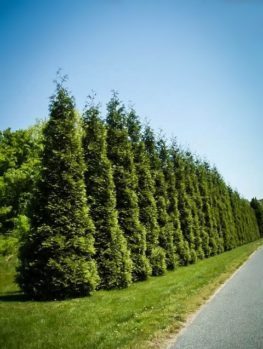 Its rapid growth means you will soon have an outstanding specimen tree or screen within just a few years of planting. When we are planning our garden designs we often forget to think about the environmental impact that we are having on the planet. Each tree, shrub and flower we plant reduces our carbon footprint and helps restore balance to nature. Sometimes we choose a specific plant for a particular reason; for instance we might have a portion of land where the soil is prone to eroding away. To deal with this we will choose a plant with an extensive root system that can weave its way through the earth to prevent further erosion. Pine trees can provide more than just benefits to the environment and your landscape. Pines are evergreen, so they hold their color and foliage well during the entire year; taller pines can provide shade to your home through the summer months, which in turn helps reduce your cooling costs. Well planned inclusion of pine trees into your garden can also help increase the value of your home or property. The Pinus nigra is most common throughout the Mediterranean forests and woodlands found around various European countries; they are most abundant in Turkey and the higher elevations of the South Apennine forests of Italy. As a young tree, the black pine retains a conical form and displays a strong growth rate; however as it ages the growth slows and the tree begins to take on a broader shape with slightly irregular branches. Its long, stiff dark green needles contrast beautifully against the tree’s dark brown to almost black bark. The branches of black pines display the foliage, which can reach up to six inches long, in bundles of two along the length of the branch. Three-inch cones also appear and display several color changes throughout the seasons before finally falling to the ground in the winter. 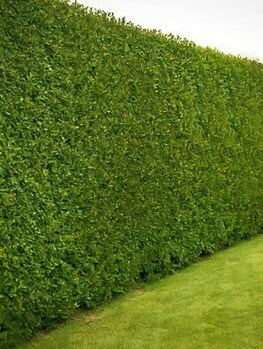 It will tower above other trees in your garden as it reaches up to 60 foot heights. The black pine will require a lot of space, as it can reach up to 40 feet in diameter. It will be best suited as a singular focal point in the center of the garden – or used to line your property boundaries in order to create a natural line of privacy. Pinus nigra is best suited for locations in USDA plant hardiness zones 4 to 7. It is highly adaptable to climate variations in these zones; from the chilly winters of Minneapolis all the way to the warmer summers of Virginia and Georgia. 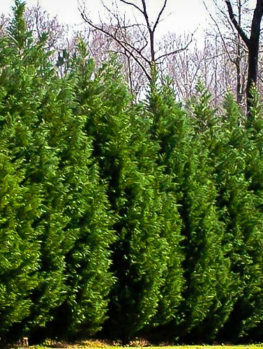 Black pines prefer planting locations that are deep and full of moist soil that is well-drained. This will encourage the tree to establish its root system early on, which can boost its initial growth rate. It can also adapt to heavier clay soils and will tolerate drought relatively well once it has established itself. 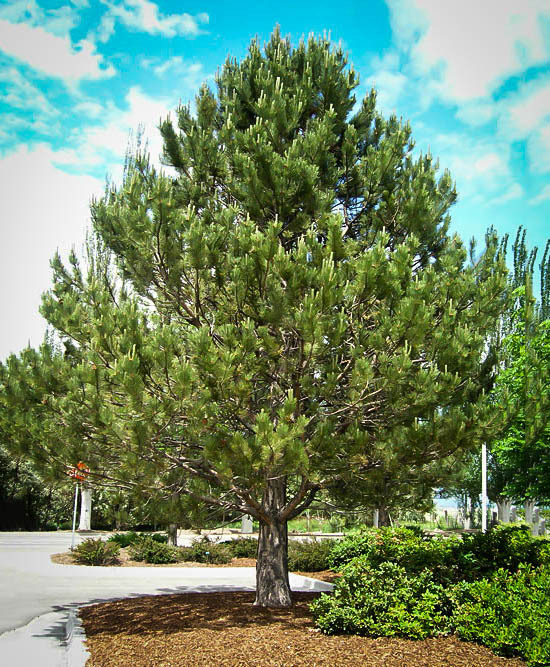 Pines love the sun, so the Pinus nigra should be planted where it can receive most of the day’s sun. Shade can discourage new growth and could potentially harm the tree in the future. Finding a suitable sunny location with enough space to accommodate its immense growth patterns is vital. Unlike some other pines that are unable to endure urban conditions, this variety is very tolerant of them and is an excellent choice for city locations. 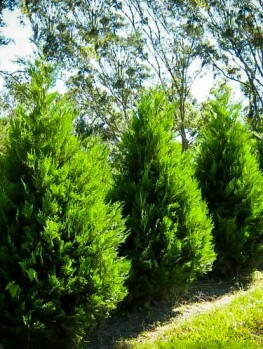 Black pines, like many similar varieties, are pretty easy to care for. Removal of dead or dying branches will be the most important aspect of care when it comes to this tree. Ensuring that it has adequate water during exceptionally long periods without rainfall is important to the tree’s survival. You will want to keep an eye out for various diseases like Sphaeropsis (Diplopia) tip blight or needle blight. Some pine moths may also appear. If you check your tree periodically, all of these issues can be dealt with early on to stop an infestation of bugs or disease before it becomes a serious issue. A keen eye and early intervention can save your tree and you a lot of money. The black pine is not suitable for locations in Missouri and more specifically the St. Louis area due to the possibility of uncontrollable insect and disease infestations. 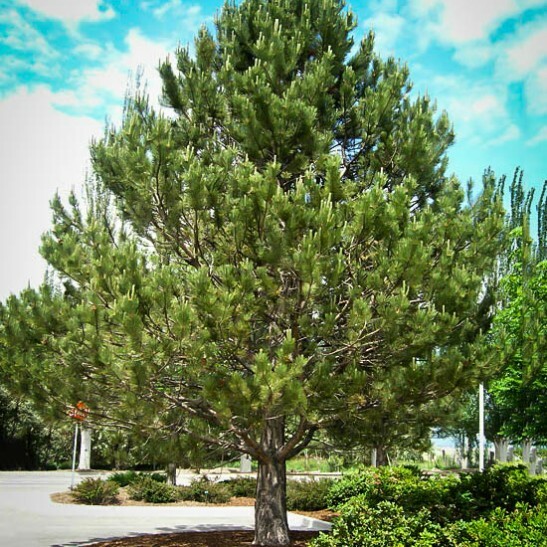 If you are unsure if your location is suitable for the Pinus nigra please call us at 1-888-329-0140 where any of our experienced staff would be more than happy to address your questions or concerns. Here at The Tree Center, we want to pass on our love of trees to you, the gardener and our customers. When you order a tree from our website, we want to help you make a positive impact on the environment. 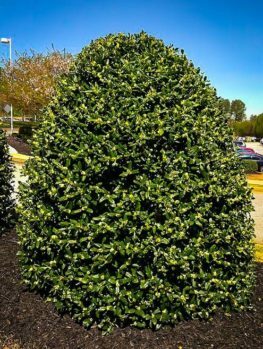 We provide the highest quality trees and flowering shrubs available that suit many needs and requirements. The black pine is no exception. By including a tree of this nature in your garden landscape you are not only getting the best specimen possible, but you are helping rebuild our planet and ensuring that future generations will love and appreciate nature as much as we do.